Last year, I went to NYC with my best friend for a Similac Event we attended to represent Modern Day Moms (her blog she founded). On our excursion, we hit up so many amazing places that we wanted to visit. We had decided on restaurants and all that. One place I had been dying to try was Momofuku Noodle Bar. She had visited before and shared photos and I could just taste it in all it’s delicious glory! When we finally went, I devoured my bowl of Ramen and my pork brisket. It was nothing short of fantastic! I am still reeling over it and since I live nowhere near NYC, I decided to find a recipe to make myself. Actually, my BFF, Jess, sent me this recipe as she had made it before herself and I seriously trust her opinion when it comes to food. She has never steered me wrong before. 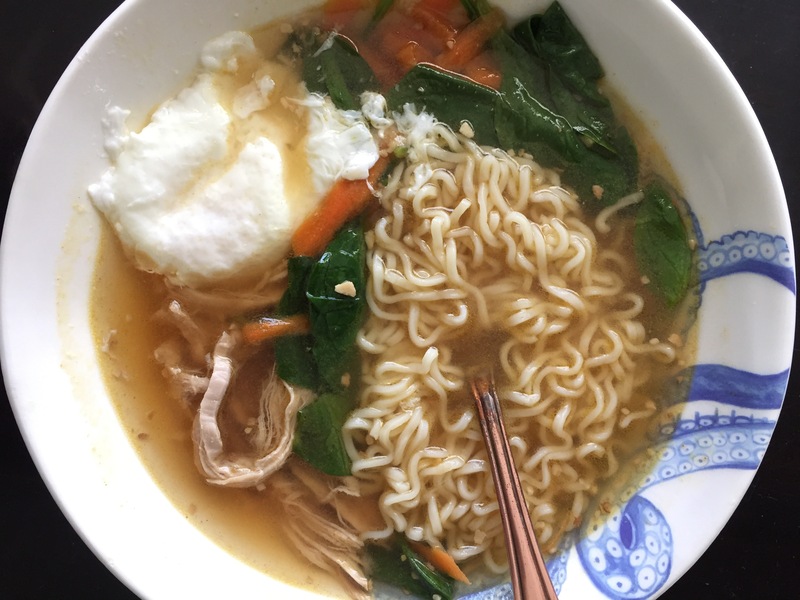 The recipe is originally by Chungah at Damn Delicious, but I altered it a bit by simply removing some items and cooking my egg differently. Wash then roast your pork tenderloin wrapped in foil for 1 hour at 350 degrees then turn it down to 200 degrees and cook for several hours. Heat olive oil over medium heat in a large stock pot or Dutch oven. Add garlic and ginger and cook until fragrant, stirring frequently, for about 1-2 minutes. Whisk in the chicken broth, soy sauce and 1.5 cups of water. Bring to a boil then reduce heat and simmer. Stir in Yaki-Soba until loosened and cooked through, about 2-3 minutes. Add pork tenderloin, spinach, carrot and chives until the spinach begins to wilt, about 2 minutes. While your spinach is wilting, bring 2 cups of water to boil in a separate pot. Only bring to a low boil, just when the bubbles appear. Crack open an egg into a small dish then pour into the boiling water. Poach for about 1 minute then add to your soup.